Holiday, Florida is small community in the southwest corner of Pasco County between Tarpon Springs and New Port Richey. It's has about 22,000 residents in less than 6 square miles. Holiday has the distinction of being home to some of the area's most beautiful parks, including Anclote Gulf Park, Anclote River Park and the newest addition Eagle Point Park. If you are looking for a Holiday pool builder to create the perfect Holiday outdoor living are for your family, we hope you'll consider Grand Vista Pools. We have been building new swimming pools in Holiday, Florida for more than two decades. Grand Vista Pools has the distinction of being both an experienced swimming pool builder and a licensed general contractor. Therefore, we can design and build your entire outdoor living space including any renovations to your home which will help your indoor living space flow into your outdoor living space. Do you have an old Holiday swimming pool that needs remodeling? Want to add some life with fire, water or lighting features? How about a spa? We can do everything from basic pool resurfacing to an extreme makeover. 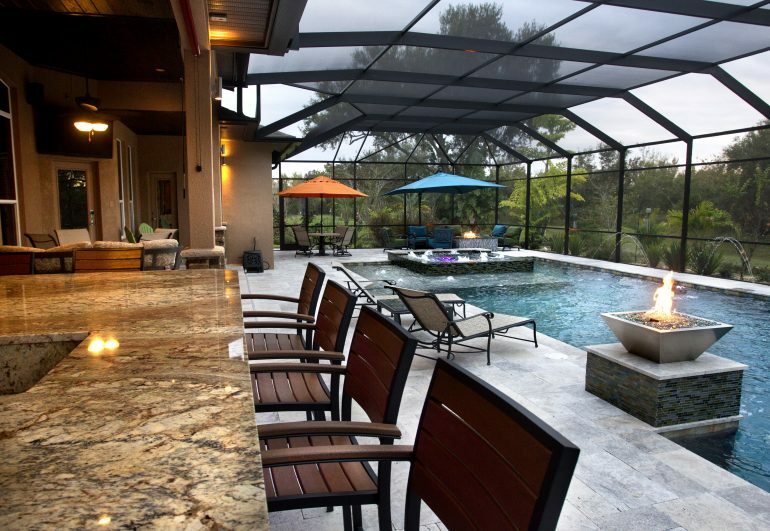 Grand Vista Pools also specializes in designing and building outdoor kitchens in Holiday, FL. If you can dream it, we can design and build it - from an outdoor grill to a full kitchen to an outdoor bar.